Outlook is the quintessential annual event for Roadnet users. 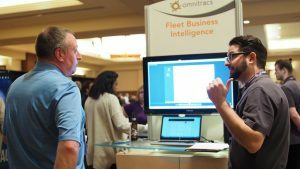 In February, Market Motion attended Outlook 2017 in Phoenix as a Strategic Partner of Omnitracs. 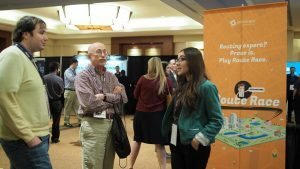 Along with all of the breakout sessions and hands-on learnings from the Partner Pavilion & Solutions Center attendees heard industry experts discuss the latest technology that will impact the industry, and were given plenty of the opportunity to meet like-minded peers to extend their professional network. Attendees piled in to get a closer look — and that unforgettable feeling of yesteryear. But one didn’t need to get close to hear or feel the energy. Tunes blared out into the “quieter” section of the venue, which was filled with foosball, arcade games, a photo booth, and on-the-spot silk screened Omnitracs concert tees. And yes, Loverboy did perform “Working for the Weekend” and “Turn Me Loose” just as passionately as ever before. 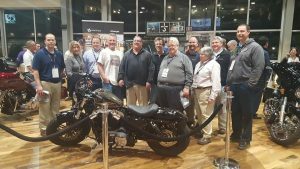 An Outlook first, Omnitracs offered customer attendees the chance to win a pretty slick custom Harley-Davidson motorcycle. To arouse interest, the Harley was parked at the entrance of the Partner Pavilion & Solutions Center, all VIP-like, with stanchions around it. On Monday night, the crowd gathered to the world’s largest Harley-Davidson dealership, the Harley-Davidson of Scottsdale, for an unbelievable experience — especially for the customer who won the Harley! Attendees enjoyed food, libations, tunes, and plenty of eye candy (we’re talking about the motorcycles). Omnitracs employees did the honors of drawing a customer name and the winner appeared to be in complete shock. He got to sit on his new hog, bang a gong, and look up at a venue filled with an envious, cheering crowd. Autonomous trucks came into discussion several times at Outlook. Omnitracs CEO John Graham talked about how the government is already authorizing this technology out in the market. ATA President & CEO Chris Spear stated that he sees that as something about 20-25 years away from now — but the framework for how that will feel is right now. How so? Platooning. In Tuesday’s general session, Josh Switkes, CEO of Peloton, explained how platooning technology works and how Omnitracs is partnering with the Silicon Valley-based company to bring platooning technology to Omnitracs customers in the near future. Should we be scared? The consensus was no — and stated several times throughout the conference. Both Spear and Cuthbertson said to be careful of the media hype. Said Spear, we still have pilots in the plane to help mitigate circumstances. Driver-assist technology is not driverless technology. Another topic that came up often at Outlook was wearables and how biomonitoring of drivers can help increase driver safety and reduce risk. One example of this could be seen right in the Partner Pavilion & Solutions Center with exhibitor SmartCap, whose wearable product uses EEG technology to measure brain technology. The predictive technology enables users to accurately monitor their fatigue level before a microsleep can occur. The game was designed to bring awareness to challenges faced by companies making daily deliveries, from staying on schedule to ensuring the most optimal delivery routes and customer satisfaction. Outlook attendees certainly enjoyed the competition! Do not fear the drone. In John Graham’s opening session, he stated that drones can add efficiency and lower delivery costs — providing about 80% savings in last mile shipping. Futurist Jim Carroll spoke about how UPS recently tested launching a drone from a truck for deliveries, reminding us that the drone can complement the truck; not compete with it.